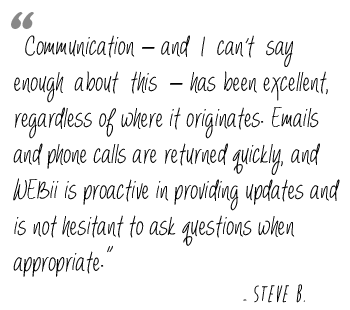 WEBii really stands out from the average SEO company, because we are stellar communicators. Our excellent communication with the customer about search engine optimization is how we remain transparent and build a relationship that is about success. Although we manage the SEO process to take the responsibility off your shoulders, we want to educate and inform you about the process, so you are never left wondering what our team is doing for your marketing efforts. Our elaborate project management tools provide you with an up-to-the-day view of the workings of your SEO Services. Our team stays on top of weekly updates, ranking reports, and monthly comprehensive campaign statistics. We share the latest important content updates and changes of interest about your SEO strategy, and we track your success. Sharing files and new web content is easy and streamlined. Our online dashboard is available to you around the clock, so you can view information and files as needed throughout the campaign. You also receive convenient email notes from the system and we are only a phone call or meeting away. We know we are great with communication, because our customers tell us so! We won’t just hand you a blank dashboard and disappear behind the scenes; you will get a minimum of weekly and monthly SEO reports, as well as frequent updates in between to share information, keyword research, competitor research and more. Compare our SEO services with other traditional media. Contact us for a free consultation about your SEO or to request a case study.